Coronary artery and veins are married life long . . . with a purpose ! Cardiologist are always worried about the supply side of coronary blood flow. It’s fair enough, we can condone our brain for this one way thinking , afterall arterial supply remain the life-line for the heart. 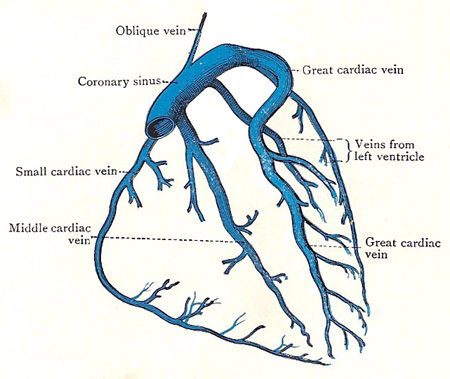 Some of us could (should) realise the importance of these humble coronary veins which are anatomically and physiologically tied together.Its existence is as unique as their arterial counterpart.Coronary blood flow of about 250 ml traverses both the arms every minute.Imagine the scenario if the veins refuse to clear the blood from previous cardiac cycle . . . total hemodynamic chaos right ? Luckily such situations are rare ! See how the the two coronary arteries and its branches interwine with the 4 major coronary veins. Is the LAD flow coupled with Great cardiac venous flow ? 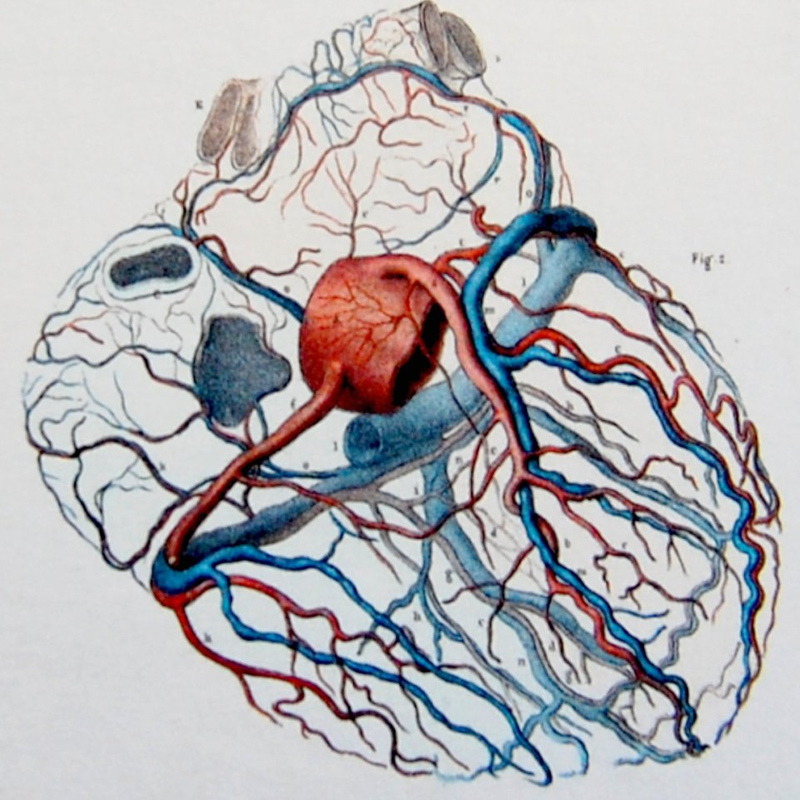 It is curious to see the LAD hugging its spouse great cardiac vein within the anterior Inter-ventricular groove , but directing the flow exactly in the opposite direction . One should wonder is it the same stream of blood from LAD ? (Near 100% So2) goes out into myocardial tissue comes back with 30 % *saturation in GCV ? If this is true , one can measure the “LAD micro-circulatory bed” integrity by computing the arrival time of levo phase blood in GCV. What happens to GCV flow in LAD STEMI ? or CTO ? In ATOs of LAD there is temporary collapse of GCV. If it prolongs it may end up in complete thrombotic occlusion of GCV which has implication in slow flow , no reflow and poor myocardial salvage. What happens when there is acute coronary venous occlusion ? Nothing alarming happens. God’s masterly protection ? Yes it is .Still its a mystery , sudden death is not the rule if we clip the coronary sinus as thebesian venous system take over which drain direct to chambers.The fact that obstruction of these veins may not result in acute coronary syndrome brings less attention to this circulation , in spite of vital hemo dynamic role . Acute venous infarct due to coronary sinus infarction is still possible. Is there chronic coronary veno occlusive disorder ? Some of the patients with chronic CAD with syndrome X /Y show extreme slow flow with normal epicardial coronary arteries.We need to study them for sluggish coronary venous flow syndromes. Microscopic analysis of coronary venous debris following PCI is our future area of study to assess the mechanisms of no reflow. Coronary veins are popular with electrophysiologist.The typical CS catheter is used to record intracardiac ECG around the AV groove . They also provide an alternate site for ventricular pacing and cardiac resynchronisation therapy. However the efficacy of CRT is related directly to the coronary venous finger print .Unless it matches with the scar free areas of ischemic cardiomyopathies the response is likely to be less. So essentially EPs are at the mercy of these veins and scars. Coronary veins can be used for retrograde perfusion of myocardium in diffuse obstructive coronary arterial CAD where CABG is not possible with some success. Coronary venous circulation has an Integral link with micro circulatory bed .It will be of huge importance to understand the highly unpredictable response of PCI with reference to myocardial salvage in STEMI and revascularisation in chronic CAD.Youngsters are encouraged to dwell deeper into the mystery of coronary microcircualtion . This one from Dr. Muller ,Florida is a perfect review to start with.